WARNING: This post contains spoilers from the latest set of NXT tapings. NXT Champion Tommaso Ciampa had been sidelined with an injury for a couple of weeks, but now it turns out that it is something major. He will require to undergo neck surgery and is out for the foreseeable future. This comes at a time when he was flying high as the dominant heel champion on the yellow brand and is a huge blow to his soaring momentum and NXT's main event scene. 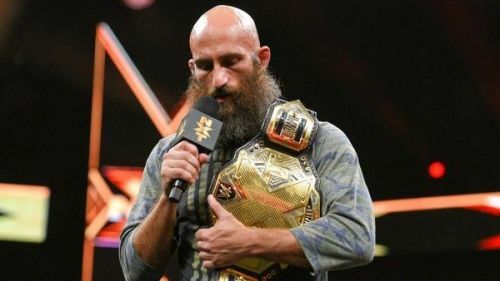 After the events that transpired during the latest set of Full Sail University tapings, the scheduled main event of NXT Takeover: New York would have been Ciampa defending the NXT Championship against Johnny Gargano. Unfortunately, that cannot happen anymore due to Ciampa's neck surgery. So now, Triple H and the rest of the NXT writers will have to come up with a plan for the main event of what could be the biggest Takeover yet. Johnny Gargano will presumably have some match for the soon-to-be-vacant NXT Championship in the main event of the show, but who does he face? Whatever happens, we should trust the NXT team to come up with the best possible plan. Here are three possible options to consider that could save Takeover. Admittedly, this option is pretty unlikely, but desperate times call for desperate measures. Aleister Black and Ricochet are currently tag-teaming on NXT and the main roster as well. They are scheduled to face the Revival and Glorious Gable at Fastlane, in a mouth-watering triple threat match for the Raw Tag Team Championship. Beyond that, they have soared through the Dusty Rhodes Tag Team Classic. Black and Ricochet will face the Forgotten Sons in the final of the tournament. Despite what the plans were for them, NXT could have them lose the match on TV due to a miscommunication and drift them into a feud of their own, and with Gargano. It must be noted that the main event of the previous tapings was the semi-final of the Dusty Classic where these two defeated DIY. This could tie into a triple threat scenario before Johnny Wrestling overcomes his previous two Takeover rivals to finally win the NXT Championship. This also gives both Black and Ricochet one final big main event match in NXT before moving to the main roster on a permanent basis.